Peggy Couey had placed two pigs named Mesha and Bitsel in a new adopted home. She wrote: A few days after Mesha moved in we placed a second pig to be her companion - same age, spayed, from a "housepig" home. Bitsel has sulked, flew into a rage and bit her new "mom" and generally refused all contact of any kind. It's the housepig syndrome. So many pigs, who have never learned to BE pigs, are suddenly thrust out of their bed and breakfast and have no idea how to cope. They don't realize that life also involves a wonderful, acorn filled wood, a pond ready for mudbaths, and a new family. All they can see is their grief at being abandoned. Pigs who have been outside in an area where they could construct a life seldom exhibit this sort of grief. They may be unhappy but its a pragmatic sort of downer. 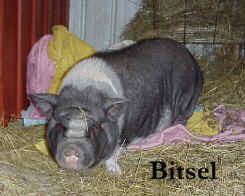 Bitsel is the pig equivalent of the child throwing herself in uncontrollable tears into her closet when she finds out Daddy has moved out. (I remember doing that myself!) Everything she knew is gone. 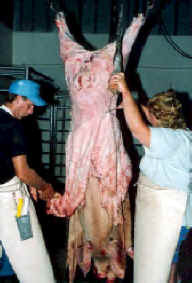 What an injustice we do these pigs when we make them so dependent on us for their entire lifestyle. She will recover. It won't be fast or easy for her or for her new caregiver but she will one day be a much happier, more well adjusted pig than she ever was in her former home. TThe Bible teaches us that we are to be responsible caregivers to all of God's non-human creatures. It is obvious that Bitsel was made to feel like a human member of her former family. She was never allowed to be the animal that God created her to be. She may have pictured herself as non-human, physically, but emotionally and spiritually, she was one of the family; a family that abandoned her without making any provisions for her to adjust to a new life, particularly one as drastically different from the one she knew. They failed in their responsibility to Bitsel. What was done to Bitsel, was the same as a human family taking their loving human child to an orphanage, and saying, "We don't want her anymore. You take care of her." The emotional distress that Bitsel is experiencing is exactly the same as any human child would feel, and perhaps worse, because she is no longer a "house pig". Not only has she lost her family, she has also lost the comforts of a human home.